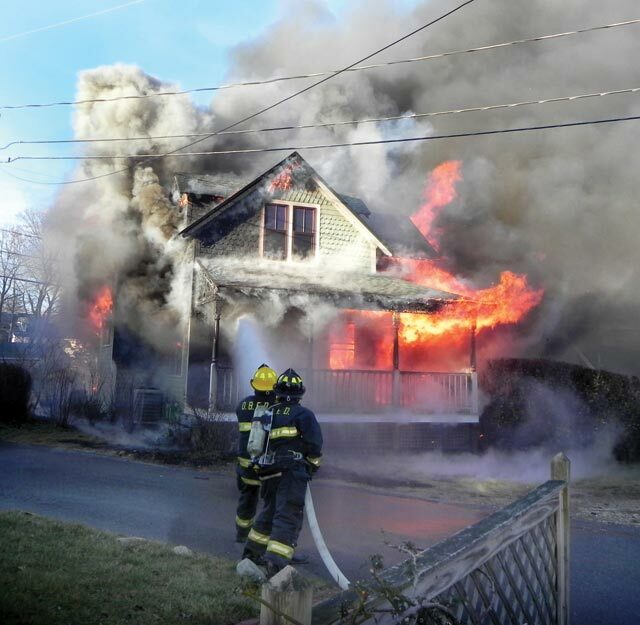 A fast-moving New Year’s Day fire destroyed a newly built Spruce Avenue house in Oak Bluffs. Arriving firefighters quickly turned their attention from saving the fully engulfed house to preventing the flames from spreading in the tightly packed neighborhood. A resident and a guest were in the house when the fire began, but escaped unharmed, according to fire officials. No firefighters were injured battling the fire, first reported at 2:50 pm, Sunday. The two-story Victorian-style house at 17 Spruce Avenue, just off New York Avenue, is owned by Ronald Jackson Jr. and Rene Jackson of Vineyard Haven. Paola Fuller, owner of Menemsha Blues, a well-known clothing store, rented the house. The initial response was hampered by a volunteer force whose ranks was depleted by the holiday and an old fire hydrant used as a lawn ornament inside the dog pen of a nearby house. The first fire company to arrive connected hoses to the authentic, but non-working fire hydrant. Fire investigators from Oak Bluffs, Tisbury, Edgartown, and West Tisbury spent most of Monday, January 2, at the fire scene working to determine the cause. Blown-in insulation used in the construction of the house made for a lot of heavy, wet, debris inside the burned structure, complicating the investigation. “It could take them a few days,” Oak Bluffs Fire Chief Peter Forend said. He was off-Island at the time of the fire, but has been overseeing the follow-up and investigation. “There is nothing to indicate it was suspicious whatsoever. At this time it seems accidental.” He said it will take several days for investigators to complete their work. The Spruce Avenue neighborhood is thickly settled, with houses just a few feet from each other, on narrow, winding streets. Firefighters worked to keep the flames from spreading to other buildings. Mr. Rose said the biggest challenge for the fire department was getting enough firefighters to the scene. Many volunteer firefighters were away for the holiday. Rene Jackson said her family bought the property four years ago, and replaced the dilapidated structure that was there with a new house. She said her husband, Ronald Jackson, an Island builder, built the house in his spare time, with the help of his brother Billy. “There’s a bit of a love story behind that house,” Ms. Jackson said. She said her family got very attached to it, although they originally purchased as an investment property. She said the family enjoyed working with neighbors and town regulatory boards to make sure the house fit into the historic neighborhood, and getting to know the summer visitors who rented the house. Ms. Jackson said her family plans to rebuild. She praised the efforts of firefighters and said she was thankful no other houses were damaged. The fire was also devestating to Ms. Fuller, who rented the home for the first time this winter. On Wednesday she was dealing with the loss of her personal effects. At the fire scene Sunday night, several hours after firefighters extinguished the flames, Mr. Ferreira was troubled by the delay caused by hooking up to a non-working hydrant. Chief Forend said the town water department owns and maintains fire hydrants and keeps lists of hydrant locations. In the heat of battling a fire, he said, it is sometimes difficult to locate hydrants. The non-working hydrant was on the property of Bob Murphy, a well-known Oak Bluffs businessman and owner of Town and Country Realty. The hydrant was upright, inside a fenced dog pen next to Mr. Murphy’s house at the end of Spruce Avenue and about 15 feet off Simpson Avenue, which borders his house. While firefighters were hooking up hoses to the non-working hydrant on his property, Mr. Murphy was at the fire scene, among neighbors who gathered there when word spread of the house on fire. He said he never considered it might be mistaken for a real fire hydrant. Chief Forend said that Island fire departments are working to implement a new system that gives firefighters an accurate location of every hydrant using global positioning satellite (GPS) technology, but it is expensive and funding has been an issue. Chief Forend said he asked the town water department to investigate. He said the hydrant was not the kind used in Oak Bluffs, though it looked very similar to the active fire hydrants used by the town. “This one looked better than some of the ones we have in service,” Chief Forend said. There is no state law or local bylaw preventing someone from using an authentic fire hydrant as a lawn ornament, Chief Forend said.